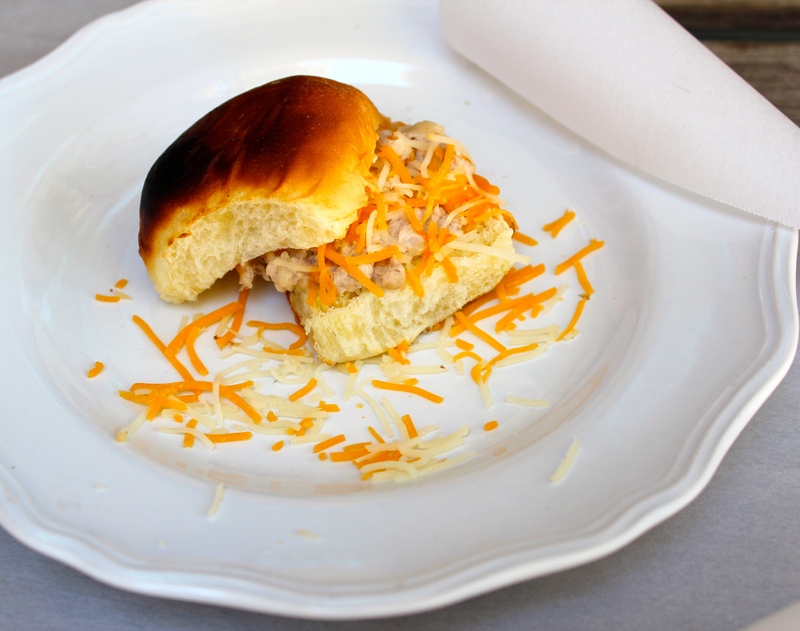 Happiness Project Recipe#58: Hawaiian Roll Tuna Cheese Sandwich! Calling all sandwich fans! Did you know that April is National Grilled Cheese Sandwich Month?? I sure didn’t. It was only after I was browsing through one of my Mommy friend’s blogs that I was tuned into this delectable celebration. Thanks be for my ever widening blogging network! Filling up the Cadiz household, one cupboard and 3 tummies at a time! So naturally, since so many other recipe masters are doing it, so must I! Ha! Herd mentality in this instance is perfectly acceptable, right? Because who on earth does NOT like a good grilled cheese sandwich?? No one I know, for sure. Ready for one of the easiest & quickest little finger sandwiches you’ve possibly ever beheld? With my husband’s all-time favorite indulgence: the wonderful (but highly addictive) Hawaiian Bread Roll? You got it! Firstly, in a medium sized mixing bowl, add in the white tuna chunks and mayonnaise, stirring until fully combined. Line up each sliced bread roll and spread on a nice sized dollop of the tuna mixture. Followed, by a large heaping of shredded cheese. Close up each filled roll, and set up to 4 of them at a time, onto a long square piece of aluminum foil. Set your toaster oven to the “Toast” setting and transfer the rolls to the oven, to crisp up for 2-3 minutes. The correct toast setting for these is all up to personal preference. I personally like these a well browned on the top and bottom of each roll. And that’s it! Easy peasey! And the perfect size to nibble on in the afternoon. Especially with little toddler hands nearby. Or in my case, a hungry husband. Happy National Grilled Cheese Month, my friends! « The Liebster Award 2015! Thank you! Putting Grilled Cheese on Hawaiian bread is Brilliant!! I’m sorry I missed out on knowing it was Grilled Cheese Month:(. I look for most any excuse to eat them! This sandwich looks so delicious! I love that you put it on Hawaiian bread! Grilled cheese month!? Guess I know what we are having for lunch today.